It’s hard to believe that we’ve been home for two weeks and I’ve had no time for any writing. Welcome back to reality! Returning home in late spring, after over a month of travel, meant lots of work to catch up on, especially yard work. And there were the elderly mother’s who were long overdue for some attention. The passing of my brother-in-law, who we’d just seen in Florida, just three days after we got home, added to the mental mayhem. 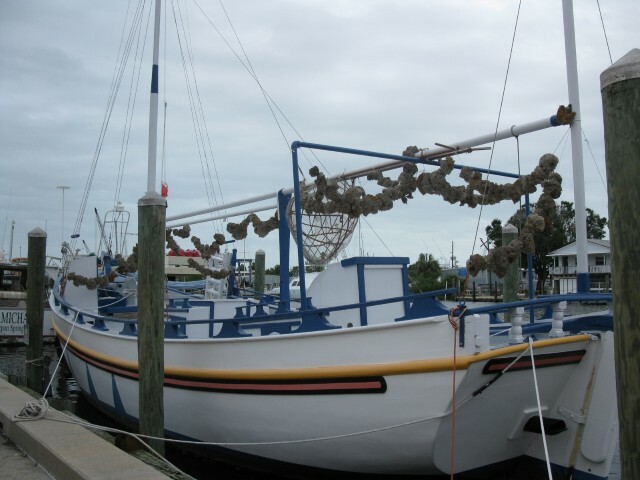 Now things have settled down somewhat, so I’m finally going to tell you about our visit to Tarpon Springs. We arrived at Tarpon Springs Florida mid-afternoon — an easy day-trip from Punta Gorda. The route we chose took us straight to the historic area, which had the atmosphere of a quaint little Greek “fishing” village with numerous old wooden boats squeaking against the docks where they were tied. 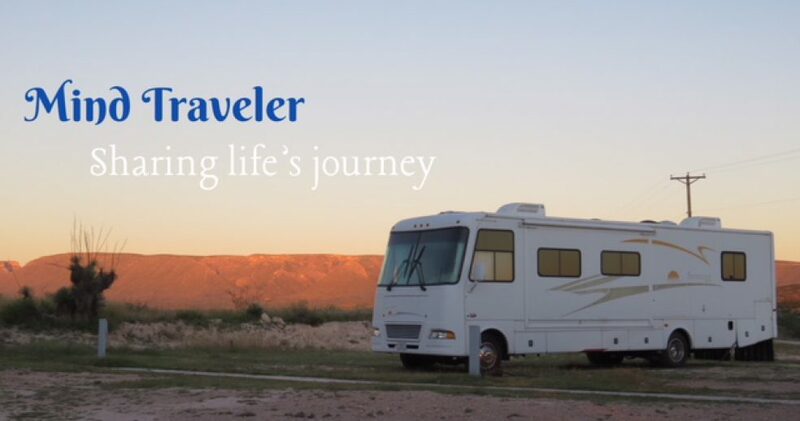 We were at first concerned about finding a place to park the RV, since the streets were quite narrow, but we saw a large parking lot with a fee of $5.00 for the day. A nod to the man at the gate and his ten finger reply told us that we could park there for $10.00. The boats aren’t really fishing boats, but sponging boats. A sign over one of the many gift shops claims Tarpon Springs, Florida to be the Sponge Capital of the World.There were certainly a multitude of sponges of various sizes, shapes and quality available in nearly every little shop along the street. One shop in particular caught our interest because of the variety, and it sold very little else besides sponges. We had a chat with the owner. 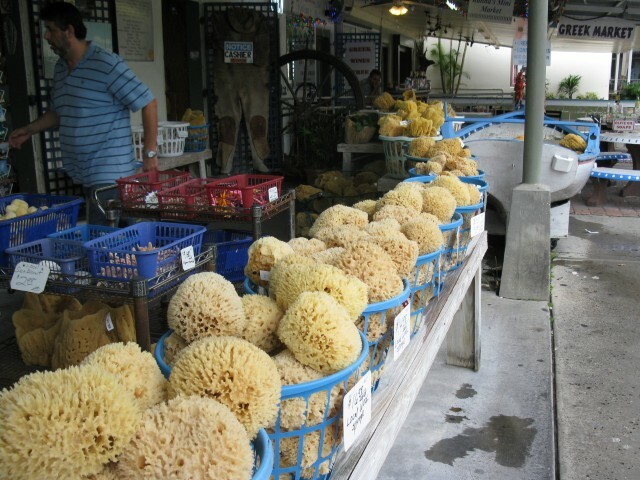 He assured us that all of his sponges were authentic, harvested from the port of Tarpon Springs. He owns some of the boats sitting at dock. They are in dock because he can’t find enough people who are willing to take on the hard work of sponge harvesting. The money is good, but the work strenuous and if the weather is good, the boats could be out for a week or two straight, until the boat is filled with sponges. His family has been in the business for three generations. We wondered how the sponges could continually be harvested without eventually being completely depleted. He explained to us that the sponges are never pulled out from where they are rooted, but cut off a few inches above the base. From that bit left, the sponges rejuvenate themselves, thus never growing too big and too old and eventually dying. That is why there is a never ending supply. The best quality sponges are found 150 feet down. Harvesters wear wet suits and masks, but unlike in the old days, they don’t wear oxygen tanks. Instead, they wear weights to take them to the bottom and they are attached by hoses to large oxygen tanks aboard the boats. They walk the bottom looking for sponges, which are usually spread out. It is a rare treasure to find a full ridge of them. 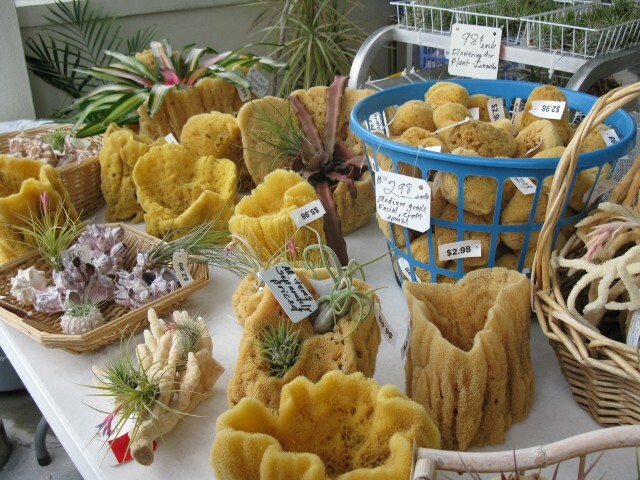 By the time we got to Tarpon Springs, we were feeling that our budget for souvenirs was about depleted, so we didn’t purchase any sponges, which sold from about $3.00 for very small, harder ones, to $50.00 for large, good quality ones. Nor did we follow the aromas wafting from the many Greek restaurants to sample the cuisine. It was time to get back on the road, but we learned some amazing things about sponges during the two hour diversion. We did find a Walmart where we replenished our supply of groceries, but RVers take note: it is not one with a large enough parking lot to accommodate over-night parking. This entry was posted in RV Travel, Travel and tagged Florida, motor home, RVing, Sponge Docks, Sponge Harvesting, Tarpon Springs, travel. Bookmark the permalink. 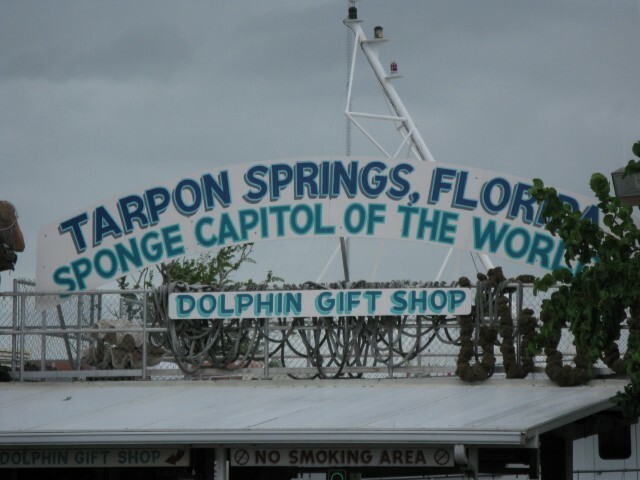 Who knows about Tarpon Springs? When I mentioned it to our neighbour, he said that was where he and his wife went for their Honeymoon. Small world!